As we roll into the middle days of June we’re seeing more familiar faces and enjoying some of the many special events that have developed here over the years. Fishing has always been all about tradition and we see a lot of them celebrated up here! Friends from Calgary, here this weekend, always toast the conclusion of another successful fishing trip with a round of fine grappa on the final evening, pouring carefully from a spectacular 3-litre bottle that sits in a place of pride in the lodge. They left this morning with some great memories, assorted boxes of fish and renewed friendships. It’s an honour to play some small part in it. Over the weekend the fishing showed signs of “progress”with the first signs of other salmon species arriving. 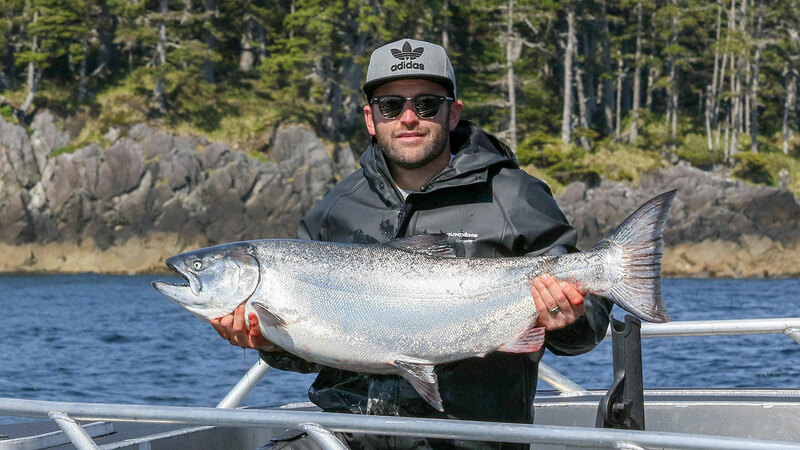 We saw a few big bright silver chum come to the dock; pound for pound possibly the toughest salmon out there. There were also some small coho and pinks in the mix, that we haven’t seen to date. Chinook fishing often requires patience and attention to detail and we’re certainly seeing that these days. Active periods are often closely attached to the tides and successful anglers are those who manage to be on their favourite point just when the tide is right. 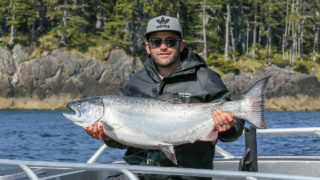 That was the case for Josh K on Sunday morning as he was fishing with Red Baron and a couple of buddies just south of Klashwun Point. They hooked up with the fish we all dream about at that spot and Josh handled it masterfully. The stunning chrome bright Tyee tipped the scale at just over 37 pounds –what a beauty! Nice fish guys! While we haven’t seen a lot of larger salmon yet, the bulk of Chinook in the area are those feisty feeder springs in the 10-20 pound class. We’re getting them more widely throughout the grounds now with Parker Point, Bird 2 and Eagle Rock providing some excitement around the slack tides. 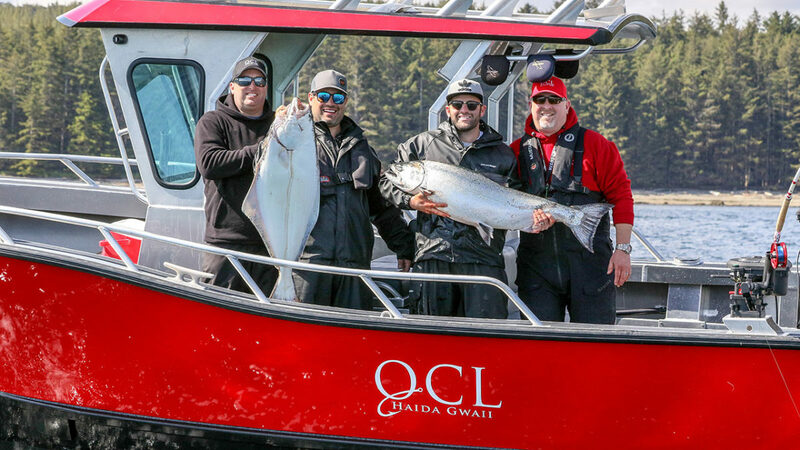 We know that halibut are commonly found closer to shore in these early days of the season and savvy anglers are picking them up while trolling along the kelp for salmon. The MV Driftwood has been anchored at the Mazzaredo Islands much of the time as we have boats spread out evenly to the east and the west. They often drop a line off the side and it’s quite common for a guest aboard to catch their limit of halibut right there in less than 50 feet of water. Sometimes they get more than they bargained for. There was excitement galore after supper on Saturday night when the tip of the rod outside the Chef’s galley door jerked down hard. A mad scramble ensued as the crew were busy pressure washing the tenders and guest Jim S was charged to deal with the fish. Problem was, once Jim grabbed the rod, the fish made a run toward the stern of the Driftwood, right under the swim grid and the crew working around it! The only way to follow the fish was to pass the rod under ropes and around boats until he could get to the aft deck, where he and first mate Ryan Winger jumped into a tender and proceeded with the battle! As the water depth was only 40 feet this fish was unable to sound and made long powerful runs out away from the boat instead. When Jim finally managed to get it close, it was obviously way too big to keep. Ryan and Chef Ricky managed to get a length measurement –a whopping 74 inches –before they released the giant, which scored out to 215 pounds! What an amazing catch in such an exceptional circumstance! Way to go Jim and the DW crew! That’s a fish story for the record books, even by Driftwood standards!